The concept of Coalbed Methane Development was operated on a commercial basis in Russia during the 1930’s and has advanced over the years. This technology is more advanced in the USA where a total of 5000 wells are producing 20 x 10 9 m3 of gas per year – equivalent to 23Mt of coal or 15Mt of oil. Click on the diagram on the left to take a closer look. The UK has a long history of Coal Mine Methane (CMM) exploitation and has seen a rapid growth in the extraction and use of Abandoned Mine Methane (AMM) in the past few years. 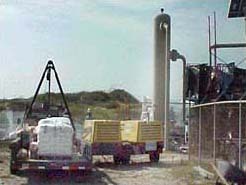 Virgin Coalbed Methane (VCBM) exploration started in the early 1990’s. Interest in Coalbed Methane (CBM) in the UK continues to grow. JMC Engineering provides a whole range of services associated with this technology – from the original exploratory drilling through to the installation and operation of the plant.